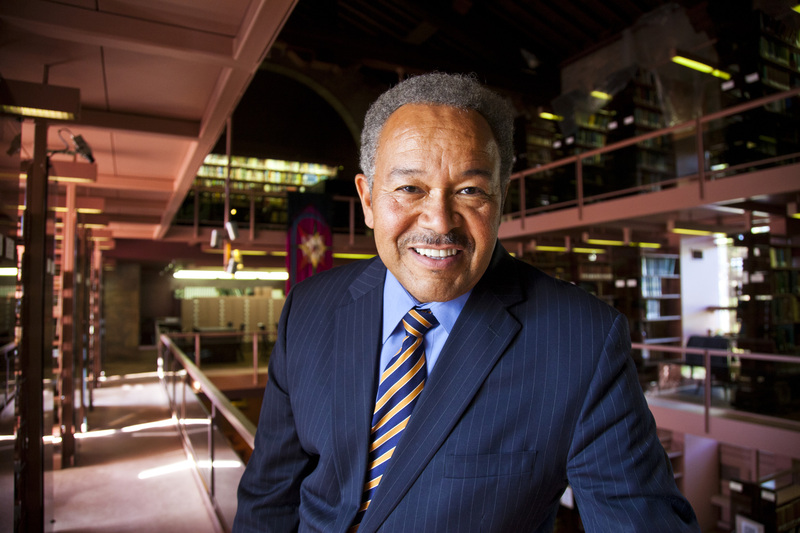 Robert M. Franklin Jr. is the inaugural holder of the James T. and Berta R. Laney Chair in Moral Leadership. • Visiting scholar at the Martin Luther King, Jr. Research and Education Institute at Stanford University (2013). • President of Morehouse College (2007-2012). • Presidential Distinguished Professor of Social Ethics at Emory University (2004-2007). • President of Interdenominational Theological Center (1997-2002). • Program officer, Human Rights and Social Justice Program, Ford Foundation (1995-1997). • Former faculty member at University of Chicago, Harvard Divinity School, Colgate-Rochester Divinity School and Candler School of Theology. • Holds ordination in both the American Baptist Churches USA and the Church of God in Christ. • Holds M.Div. degree in Christian social ethics and pastoral care, Harvard Divinity School (1978); and Ph.D. in ethics and society, religion and the social sciences, University of Chicago (1985). • Author of: "Crisis in the Village: Restoring Hope in African American Communities" (Fortress Press, 2007); "Another Day’s Journey: Black Churches Confronting the American Crisis" (Fortress Press, 1997); "Liberating Visions: Human Fulfillment and Social Justice in African American Thought" (Fortress Press, 1990). Emory University's Candler School of Theology has named Robert M. Franklin, Jr., one of the nation's foremost public theologians, to the James T. and Berta R. Laney Chair in Moral Leadership. As the inaugural holder of this endowed professorship, Franklin will shape a program in moral leadership that honors the legacy of Emory President Emeritus Laney and his wife. Jim Laney, who led the university from 1977-1993 and served as Candler's dean from 1969-1977, believed in providing service to the world by engaging in the traditions, values, virtues and vision of the community. Berta Laney provided dedicated service to others, creative initiative in numerous educational programs, and active engagement for justice and peace. "The Laneys bequeathed to Candler and Emory a legacy of moral leadership that continues to distinguish our school and university today, and we honor this heritage by establishing the Laney Legacy in Moral Leadership," says Jan Love, dean of Candler. "We are thrilled that Robert Franklin, a gifted educator, scholar and thought leader, will inaugurate the chair and develop the program in keeping with the intent and spirit of Jim Laney's exemplary public servant record and Berta Laney's dedication to community well-being," Love says. As the Laney Professor in Moral Leadership, Franklin will teach courses on moral leadership and direct a program that challenges students to embrace and extend the concept of moral leadership in various contexts and cultures in the United States and around the world. Franklin will be installed at Candler's fall convocation on Aug. 28 and begin teaching in the fall semester. He also will continue his work as senior advisor for community and diversity to the provost at Emory through 2016, and his post as director of the religion department at Chautauqua Institution in Chautauqua, N.Y.
Franklin, president emeritus of Morehouse College, a former Presidential Distinguished Professor of Social Ethics at Emory, and former director of Candler's Black Church Studies program, says it is a "monumental honor" to occupy the chair. "Jim Laney is a moral visionary," says Franklin. 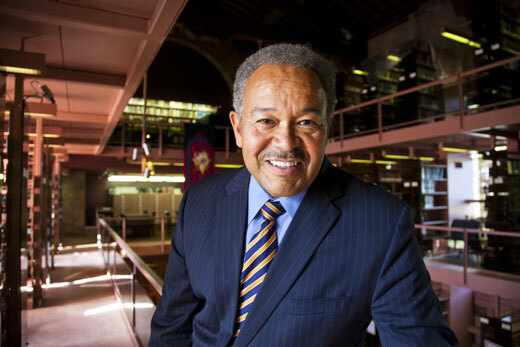 "He's a pastor, an educator and a public intellectual who cast a bold and inspiring vision for Emory that extended far into the world, and I am deeply honored to work under his legacy and continue to fulfill his vision." That vision, Franklin says, is to prepare the next generation of moral leaders, which he defines as "women and men who act with integrity for the common good." "We are touched and honored that Dr. Franklin has agreed to be the first occupant of the Laney Chair in Moral Leadership. This is truly a distinguished appointment," says Jim Laney. "He brings broad and rich experience, an impressive stature and a distinguished national reputation. He embodies the very qualities I associate with moral leadership." • Visits with agents of change and civic leaders within metro Atlanta area. The James T. and Berta R. Laney Chair in Moral Leadership provides for an endowed professorship focused on challenging students to embrace and extend the concept of moral leadership in various contexts and cultures in the United States and around the world. Unlike “celebrity” leadership that stresses individual heroism, achievement, or success, moral leadership provides service to the world on behalf of the community. Such service has been a hallmark of the Laneys' lives. Jim Laney’s tenure as president of Emory University and dean of Candler School of Theology was distinguished by moral leadership, a legacy that continues to shape the character of servant leaders today. Berta Laney’s focus on education, justice and peace initiatives, and international mission work reflect her own thoughtful commitment to moral leadership. The Laney Chair in Moral Leadership honors these visionaries in ethical servanthood.